Lompoc Brewing will host its annual Black Out Beer Fest on Friday, Feb. 21 from 4 to 11pm at Sidebar, 3901 N Williams Ave. 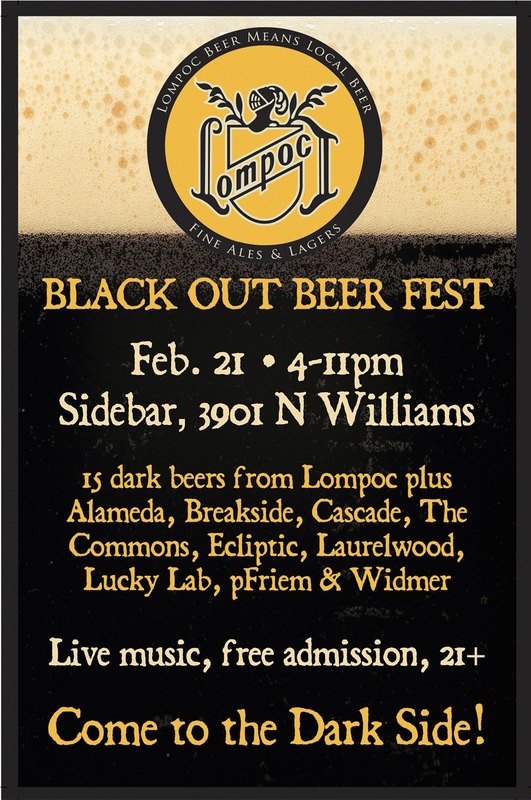 The Black Out Beer Fest will feature 15 dark beers from Lompoc and special guests Alameda, Breakside, Cascade, The Commons, Ecliptic, Laurelwood, Lucky Lab, pFriem and Widmer. Tasting packages are required to drink the beers and cost $15, which includes a souvenir 15.5 oz glass tasting mug and 10 beer tickets. Additional tickets are available for $1 apiece. It costs four tickets for a full mug or $1 for a taste. Mug and ticket sales take place in Sidebar; the beers will be located in Sidebar, the brewery bar and the tented and heated parking lot. Live music will be provided by Leslie Lou and the Lowburners. The event is for ages 21+. The beer lineup features Alameda 2012 Siberian Bear Russian Imperial Stout; Breakside Salted Caramel Stout; Cascade Milk Stout; The Commons Boysen Imperial Belgian Porter; Ecliptic Mintaka Export Stout; Laurelwood Baltic Porter; Lucky Lab CDA; pFriem Belgian Stout; Widmer Creaminess Rye Stout; and Lompoc 2013 Sour Stout, Batch 69 Baltic Porter, 2010 Bourbon Barrel Aged Monster Mash, 2009 Merlot Barrel Fermented Batch 69 Baltic Porter, Galia Belgica Belgian Strong Dark, and the release of Cherry Wood Porter. PORTLAND, Ore. – Who serves the best clam chowder in the city? 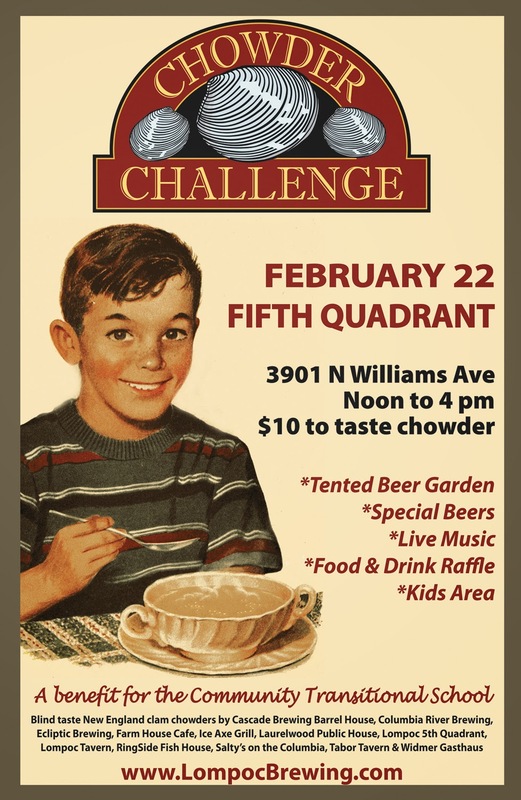 A dozen local brewpubs and restaurants will vie for the coveted Chowder Cup at the 8th annual Chowder Challenge on Saturday, February 22 from Noon to 4 pm. The blind tasting competition will take place at Lompoc’s Fifth Quadrant, located at 3901 N Williams Ave. Participating restaurants include Cascade Brewing Barrel House, Columbia River Brewing, Ecliptic Brewing, Farm House Cafe, Ice Axe Grill, Laurelwood Public House, Lompoc 5th Quadrant, Lompoc Tavern, RingSide Fish House, Salty’s on the Columbia, Tabor Tavern & Widmer Gasthaus. Two-ounce samples of traditional New England-style clam chowders from each of the participants are served in non-labeled tasting cups. After tasting all entries, attendees vote for their favorite. The chowder receiving the most votes is named the People's Choice Winner and takes home the coveted Chowder Cup; awards are also given for second and third place. There is no charge to attend the event. To taste the chowders, attendees ages 12 and over purchase sample trays for $10. All of the money raised will be donated to Portland’s Community Transitional School, which provides important educational services to children who are homeless or otherwise at risk of school failure. The festivities also feature live music by Leslie Lou and the Lowburners, a beer garden, a kids area, a raffle with prizes from the participants, and pub food for purchase. Minors are welcome at the family friendly event. The New Old Lompoc won the inaugural Chowder Cup; the Morrison Hotel stole it away the next year, but it was wrested back by the New Old Lompoc at the next four events. Last year, with the New Old Lompoc out of the competition while being rebuilt, the Ice Axe Grill swooped in and took the cup. Now that the New Old Lompoc has been revived as the Lompoc Tavern, it’s anyone’s game!